In a repeat of last year’s final, Hermes took a little while to break down Trinity’s defences – with former Hermes junior member Jessica Elliott pulling off a couple of fine saves – before pulling away. Chloe Watkins (pictured, left) scored from the flick spot after 20 minutes to get the ball rolling. Her side led 2-0 by the break and eased away in the second half with Linda Caulfield and Anna O’Flanagan getting on the score sheet. Railway kept the bouyant mood going into the winter break with a solid win over Glenanne in St Mark’s thanks to goals from Cecelia Joyce and Emma Smyth, both via deflections. Joyce’s came from free-in on the edge of the circle while Smyth’s was of a more spectacular variety – diving to get a touch on Kate McKenna’s cross. 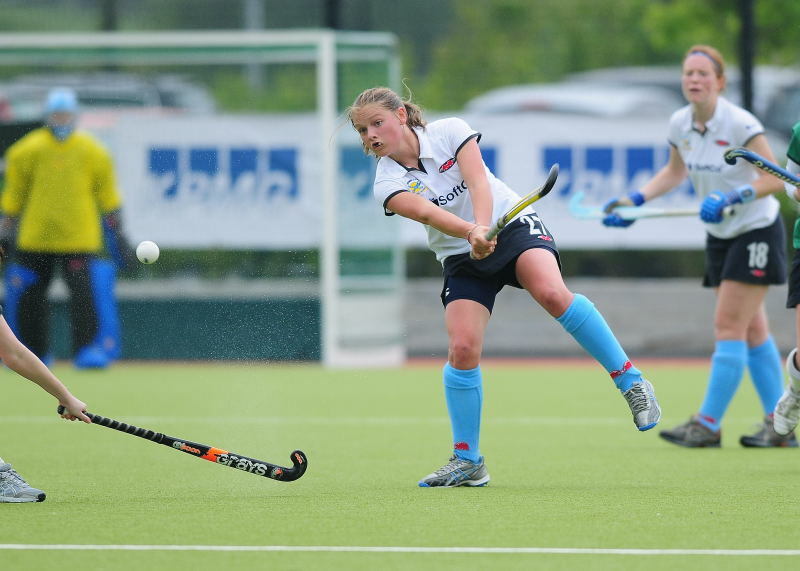 Glenanne were unfortunate not to pull one back with Nikki Daly and Mary Waldron showing some impressive turns while defender Hannah de Burgh-Whyte was Railway’s stand-out presence. Corinthian started brightly against the students, forcing four corners despite being short a few players due to injury and illness, but could not take advantage, the closest effort saved off the line by Laura Wilson. 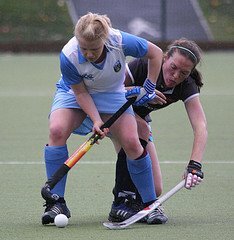 UCD responded with a couple of corners of their own from which Holly Jenkinson drilled home for the lead, doubled within 10 minutes – during the Belfielders best period of the game – when Lisa Jacob reacted quickest to a rebound to make it 2-0. Corinthian, though, were back in the game at the break after another corner rebound was swept in by Aimee Williams. Spurred on by Amanda Walker, Susie Geoffroy and Carol McGowan, the reds kept the momentum going with the hope of an equaliser. Catriona McGlip (pictured), though, turned the game UCD’s way with two goals to stretch the lead to 4-1, the first after a weaving run, the second with assistance from Fiona Braddish. Corinthian added a second from a corner with ten minutes to go through Geoffroy. Bray produced the result of the round to beat Loreto’s firsts for the first time in the club’s history and complete a nightmare weekend for the Beaufort-side. Colleen Bayliss got the vital stroke while Irish international keeper Mary Goode was in incredible form throughout. Janet Murphy gave Bray the lead 20 minutes in before Nikki Symmons leveled matters with five to go before half-time. The second half saw Bray endure a huge amount of pressure with Goode pulling off a number of saves while Cathy Brock, Mairead Mahon, Grainne Howe and Baylis stood firm in the face of an onslaught from Loreto’s international stars. The visitors racked up over ten corners but Murphy almost stole the win in normal time for the seasiders with a late chance. Extra-time was a more even affair, preluding strokes. It gave Bray probably their biggest scalp since the club’s inception.